Sharing Files in a Cloud Workspace -3 Must Know! Virtual workplaces are the new traditional workplaces. 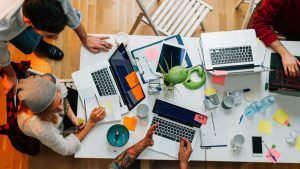 Businesses nowadays mostly run with remote employees who are collaborating and working from every corner of the world and a variety of devices. The brick and mortar offices are longer able to meet the needs of today’s locomotive workforce. That’s exactly why organizations that are self-aware of this demand are upgrading and deploying innovative file sharing systems to support their remote employees. However, the main question remains, how do you meet these needs without compromising the data security that your company’s IT requires. The ability to securely share files boosts the employee’s productivity and if that is hindered in any way, the business ultimately suffers the consequences. Setting up digital workspaces, with secure file sharing protocol, not only simplifies the day-to-day activities of your employees, it simplifies IT and spikes productive work. Yes, the fundamental concerns of sharing anything over the network is, of course, data security. Today IT security for files transferred over the internet has improved from what it used to be. Now it is not enough to have your files securely saved, your employees, partners will have to collaborate with you on those files in a real-time. So that’s why your file sharing system should be collaboration friendly. Since business mostly run on data, it makes sense now more than ever to have a file sharing system, that allows access to files from anywhere at any time and on any device. Having all your apps in one place that is easily accessible is an ultimate productivity booster for remote and mobile employees. This is exactly the problem V2 Cloud Workspaces is solving for SMBs with remote employees. More information on that here. The V2 Cloud digital workspace has an integrated secure file sharing functionality that allows you to securely transfer files between workers on the same workspaces. When all your employees worked in the same physical office, it was easier to secure your data with just a firewall. Now they are working remotely from different locations, on different devices and they still need access to the same set of files and data. Your digital workspaces need more than just an access policy, you need to know who, what, when, where, and why is accessing your files and that calls for an authentication system as part of your file sharing protocol. Employees, partners, and business associates need a simple and easy to understand secure file sharing system that can allow them to collaborate and work on their files across various devices and locations. V2 Cloud Workspaces provides a simple solution to desktop data, file, and applications sharing via a secure channel.